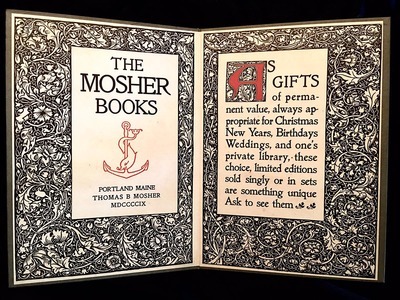 Just a few weeks ago I was delighted to hear that collector and bookseller Philip R. Bishop renovated and relaunched a website devoted to the work of American private press pioneer Thomas Bird Mosher (1852-1923) of Portland, Maine. As Bishop writes of him, “Mosher’s contributions to the private press movement in the United States rank him high as a major exponent and promoter of the British Pre-Raphaelites, Aesthetes, and Victorians to his fellow Americans.” This comprehensive website complements Bishop’s bio-bibliography, Thomas Bird Mosher: Pirate Press of Publishers (Oak Knoll Press, 1998). Bishop picked up his first Mosher Press book--Richard Jefferies’ The Story of My Heart--in the mid-1980s, I learned when I interviewed him for my book, Rare Books Uncovered. He was first captivated by the content but also impressed by the aesthetics of the book itself. Thus began Bishop’s collecting journey; his Mosher Press collection is now, far and away, the best and most extensive of its kind and includes books from Mosher’s personal library, Mosher-printed books in fine bindings, inscribed and association copies of Mosher books, manuscripts, ephemera, and more. Currently, three highlights from Bishop’s collection are on view in New Members Collect at the Grolier Club through July 30. Image: Advertising Diptych for The Mosher Books. Courtesy of Mosher Books. Just a few weeks ago I was delighted to hear that collector and bookseller Philip R. Bishop renovated and relaunched a website devoted to the work of American private press pioneer Thomas Bird Mosher (1852-1923) of Portland, Maine. As Bishop writes of him, "Mosher's contributions to the private press movement in the United States rank him high as a major exponent and promoter of the British Pre-Raphaelites, Aesthetes, and Victorians to his fellow Americans." This comprehensive website complements Bishop's bio-bibliography, Thomas Bird Mosher: Pirate Press of Publishers (Oak Knoll Press, 1998). Bishop picked up his first Mosher Press book--Richard Jefferies' The Story of My Heart--in the mid-1980s, I learned when I interviewed him for my book, Rare Books Uncovered. He was first captivated by the content but also impressed by the aesthetics of the book itself. Thus began Bishop's collecting journey; his Mosher Press collection is now, far and away, the best and most extensive of its kind and includes books from Mosher's personal library, Mosher-printed books in fine bindings, inscribed and association copies of Mosher books, manuscripts, ephemera, and more. Currently, three highlights from Bishop's collection are on view in New Members Collect at the Grolier Club through July 30.